In recent years, in many “western” schools teaching Chinese has been initiated and I have been fortunate to be one those who have had the chance to teach it in high schools (in Italy). I confess that I found myself taken aback since I didn’t have even a minimal idea of how to teach this difficult language to such young learners. For this reason, the first few years I took refuge in the university teaching method and I used a grammatical-translation approach that, which I only realized later on, didn’t produce the hoped for results. Now I’d like to share a few techniques based on my experience as a teacher and the master in teaching Chinese language as a second langugae. First of all you’ll need an indispensable premise: for any teaching operation (not just teaching Chinese) we have to choose the most opportune strategies, having the knowledge that every context requires a specially thought out solution based on who is in front of you, the time available, and the teaching tools in your possession. Therefore, there’s no one style or unique response when it comes to teaching and learning. I think that we can all agree that to be competent and professional, a good professor shouldn’t go on memory, improvising a lesson when they enter the classroom, but should prepare the lesson at least one day ahead of time, trying to come as close as possible to the needs and attitudes of the students. Although each student frames the methodological question of learning to their own perspective, there are however common tendencies that have been found relating to two particular factors: the role of the professor – a professor as a director (导演) and not the protagonist of the educational action – and the teaching context. Like almost all Chinese university students in a good number of western universities, I too received instruction based on a formalistic approach and therefore a grammatical-translation method. The focus of learning Chinese was given to grammatical rules that were learned through translating Chinese phrases to my mother tongue. All my Chinese teachers have always held that grammatical correctness was prevalent regarding the true use and practice of the language, favoring a passive knowledge rather than an actual communicative mastery. For this reason, many manuals of Chinese grammar have been written and they continue to churn them out without stop (especially in English). Nevertheless to learn the rules of grammar, my teachers usually had us work on surreal phrases that never had any pragmatic use in the socio-cultural context that surrounded us. For example one thinks of the famous “the book of my friend’s older sister’s professor that’s on the red table next to the chair is interesting”; which, among other things, are nothing more than determiners, allowing the learner to perfectly enunciate all Chinese grammatical rules but still not being able to chat for a few minutes with a native Chinese speaker. Nevertheless, as Professor Balboni said, translation serves to verify a student’s language level, but shouldn’t be a tool for mastering the language. To summarize, I found a tendency to complicate Chinese as much as possible in the conviction that it would facilitate acquisition. Motivation: the key to learning? An approach derived from a university teaching isn’t possible in high schools because those students are different than university students in many ways: prerequisites, motivation and concentration. Due to this last point it’s clear that when teaching in schools you need to dwell on the necessity of motivating students that are still immature to get their concentration up. For example, to learn 把, you can start with games based on recipes of Chinese dishes that involve the real use of language that stimulate the students’ curiosity. I stress once again the importance of motivating students! Tell anecdotes, experiences, show videos, films, animated cartoons, take students on excursions and guided visits (for example to the Confucius Institute), these can show themselves to be excellent methods to stimulate them to study. Don’t forget to prepare them for the HSK exam: there’s nothing more motivating than to achieve a linguistic certification, when it comes to a more concrete result that can be attained thanks to learning the language. Another great activity could be a Chinese Bridge amongst themselves where students can speak in Chinese without anxiety (all should win a prize if they deserve it!) or summer camps as a reward for those who work harder. Other motivating activities can be Chinese competitions between different classes of the same year. Since, contrary to what one might think, we best remember what we hear first and what we see second, in harmony with Gestalt’s theory of perception, you can use audio-visual support materials and smartphone applications to keep high school students’ motivation high. These days there are lots of apps that allow for greater learning with a great economy of time, since you could potentially study anytime, anywhere. In my opinion you’ll need to dedicate some time in your lessons to present and illustrate how these apps work, just as you should surely teach how to use Chinese search engines. The use of software is a great novelty that you don’t think of. The current generation is made up of digital natives, so why not take advantage of cell phones and computers to teach? Software and phone apps are very much used by students for all materials, so why not use them with Chinese as well? The use of linguistic technology is absolutely encouraged. Before starting my Masters in teaching Chinese, I taught for 5 years. In those years of teaching, I too was firmly convinced of the usefulness of a formalistic approach and adopted them in almost all lessons, finding a great level of interest on the part of students. I added a few activities to my bag, but never got away from the formalistic approach, feeling that a game for example was a waste of time (nothing could be more wrong!). Games and play activities lower the affective filters, break the monotony and allow for a better and more lasting impression when you’re looking to learn. A wide gamut of games and activities to use can be found in the book “汉语课堂教学技巧325例”, which has 325 examples of effective activities that are easy to propose to students. I learned that a game is not at all a waste of time, but rather lets them forget that deeper study is also an obligation since many consider it an insupportable weight; by playing, the student learns by enjoying themselves. The affective filter is notably lowered, as is the level of stress which makes memorization difficult. If then the professor puts themselves in the game, the student will remember that the professor is a person first, then a professional. Remembering that the professor was also once a student can be very useful, especially with a difficult language like Chinese (if he can do it, why not me?). Something that one never thinks about is putting the teaching focus on the use of language instead of grammar, as well as pursuing this objective through a simplification of the language reachable via a variety of games and play activities designed to motivate the student. Why would a teacher greatly prefer explaining grammar and not the use of language? There are various motivations behind this question. First of all, the lack of time: a competent language teacher masters grammar well and can come into a classroom and quickly improvise any explanation of grammatical rules; secondly, a European language speaker can’t help but cling to linguistic rules and certain schemes, and the same happens with the students! You surely need to insist on the oral communicative function rather than a written one, through very useful exercises that only involve the use of pinyin and not Chinese characters. I already fed this last type of exercises to my students and it turned out to be a huge success, also because the student will feel motivated because they feel comfortable using something that can be read without trouble, instead of the complicated Chinese characters. Another thing that you never think about is the use of real recordings (ads, film clips, news broadcasts) instead of exclusively using the audio clips contained in textbooks. Staying on a phonetic theme, if at first, without any experience, I conceived phonology as rules of pronunciation making comparisons with my mother tongue (saying, for example, that the c in pinyin is pronounced like the phoneme in the Italian word “pazzo”), now I ask the students to simply imitate the sounds of the words when they hear them, contrasting the two words that contain similar sounds(BP, DT, GK, JQ, ZC, ZH/CH). I also put up for discussion the traditional sequence with which tones are usually studied, preferring this alternative sequence: 1st Tone, 3rd Tone, 2nd Tone and 4th Tone. This new sequence can be very useful to students because if helps them better distinguish the difference between tones. Another thing I never paid attention to was the students’ use of the interlingua (中介语). I originally thought that the interlingua would be corrected immediately, but this only serves to demotivate the student by making them feel inadequate. Now I understand that the student has the right to make mistakes with what they haven’t learned yet but will learn naturally. To do this, we have to insist that the student comes to correct their error on their own. After all, we too, students with lots of experience with Chinese, still use a sort of interlingua when we speak in Chinese. Only those who have lived for years and years in China are able to speak like a native in all things… don’t you agree? When it comes to writing, a large problem emerges for students that can only be found through experience: the students’ tendency to write characters based on how they’re written on the pc, so in 打体字. In effect, this is a problem that I came across often, especially with the root of the three drops of water. Despite having corrected errors like this many times, I never thought to dedicate a lesson about the difference of written characters on the chalkboard and those written on the computer. However many high school students have a hard time recognizing characters because they’re only used to seeing them on the chalkboard or just on the computer. 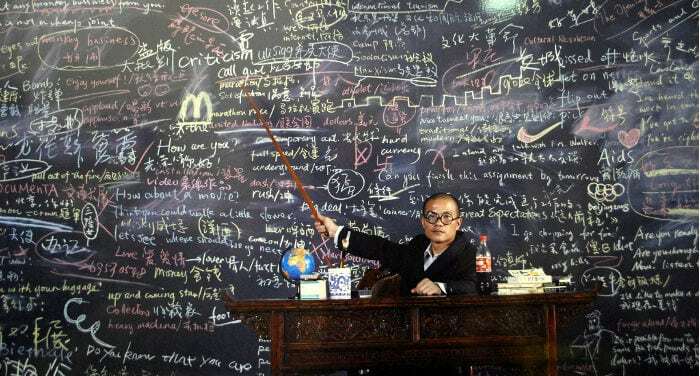 When it comes to teaching advanced Chinese, I recommend that you avoid the immediate translation of complete phrases, preferring instead a detailed analysis of grammatical classes for the students present. To do this, you can propose skimming activities in search of syntactic/particles of function markers (在，的，了，就) which give precious information about the importance or priority of the words. With this method you can get your student used to thinking in Chinese rather than understanding whatever phrase by translating from Chinese into his/her mother language. So translation (considered by many as the fifth linguistic ability) shouldn’t be used to learn the language but only as a tool for checking oneself. A very useful exercise could be to translate one’s own language to Chinese so that you can apply the grammatical rules and more easily remember the vocabulary. When it comes to vocabulary, you don’t want to exclusively turn to recopying the same character hundreds of times like a scribe (I expect that, alas, you can’t skip it completely), so you can use the famous flash cards or, again, smartphone apps. There are many apps and a lot are also free (and absolutely valid!). This is a very delicate aspect because it is indispensable from a study of the language, even if its often forgotten. Always remember that the language is a convention that presents strong cultural sections, but at the same time is also a vehicle of these cultural conventions. Culture is taught to be able to better understand the speaker’s mindset of a given language. How do you teach Chinese culture? According to me you need to start from simplified Chinese texts with themes that present connections with students to motivate them to study. The texts must therefore be nice and meaningful, and very importantly, they must be without the useless digressions that only weigh the text down and, even if studied well, will be forgotten the next day! To conclude, I want to underline the importance of focusing on the ability to listen and speak, to then move on to reading and writing; moreover, it’s very important to transform input into intake (摄入 or 纳入) to be able to get to what Krashen defines as acquisition (习得). How? You need to keep your explanations simple, always different, based on what has already been learned, going back over the same subjects often, knowing that learning is a circular process. Lastly, I recommend that you not overuse 了 and not pass on this “bad” habit to the students.